France's extreme right party Front National claimed almost 25% of the votes at the European election, finishing for the first time as the first party in the country, four points ahead of the UMP. The ruling Socialist Party didn't even reach 14%. French PM Manuel Valls described the results as an "earthquake". They're even worse than 12 years ago, when Jean-Marie Le Pen finished second at the first round of the Presidential Elections, kicking socialist PM Lionel Jospin out of the race for less than 200,000 ballots. Jacques Chirac went on to win the second round, but a few months later his gaullist, conservative RPR merged into the new center-right UMP. 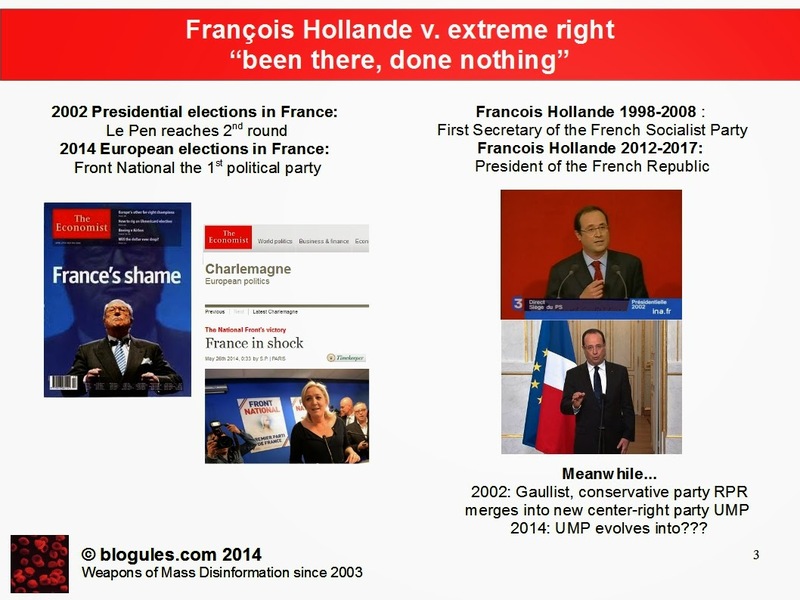 Surprisingly, the humiliated PS refused to reform, and it had something to do with the "leadership" of its First Secretary Francois Hollande, a person who loves to talk about change, but has never done anything to prove it. When Hollande got elected in 2012, I wrote "France refuses to change" because there was no better way to sum it up. The scariest thing is not the earthquake, but the desperate flatness of French democracy's EEG. When democracy stalls, extremes always win. And the FN didn't even have to modify its DNA to win: Jean-Marie Le Pen claimed one region, his daugther Marine another, and Marine's mate Louis Aliot yet another. The only good news may be the fact that the UMP is at long last forced to dump Sarkozy's doomed "rightization" strategy. In the weeks and months to come, the party will either evolve towards the center, or implode. The Socialist Party imploded a long time ago, but managed to win an election here and there, when its rivals played it even dumber than dumb. France cannot afford two zombies any longer. Also on blogules V.F. : "Séisme ou Encéphalo Plat?"